For the genus of fungi, see Gibellina (fungus). 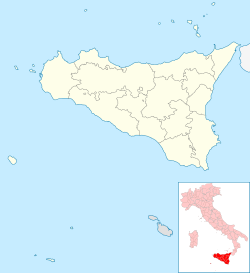 Gibellina (Sicilian: Gibbiddina) is a small city and comune in the Province of Trapani, the mountains of central Sicily, Italy. It was destroyed by the 1968 Belice earthquake. The new city, Gibellina Nuova, was rebuilt some 11 kilometres (7 mi) distant from the old one. The new city was designed by many of the most prominent artists and architects in Italy, but done in a piecemeal fashion so that the parts of the new city bear little relation to one another or to the indigenous architecture of Sicily. Ruderi di Gibellina (as the ruins of the city are now referred to) remained just as it was after the earthquake, practically a ghost-town. Artist Alberto Burri covered the entirety of the ruins in concrete, while preserving the streetscape. Additionally, Italian sculptor Pietro Consagra and Senator Ludovico Corrao formed an open-air museum with a Consagra sculpture "Porta del Belice" or "Door to Belice" at the entrance. Consagra expressed a wish to be buried at Gibellina on his deathbed in July 2005. Ruderi di Gibellina by Gabriel Valentini. This page was last edited on 8 September 2018, at 06:17 (UTC).